July was exceptionally warm in southern and central Finland and various temperature records were broken on several occasions. Most notable was the breaking of Finland's previous temperature record that had been measured in Turku in July 1914. 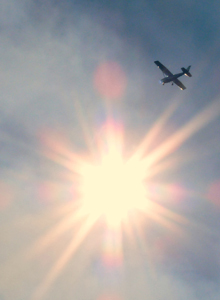 At Joensuu Airport in Liperi, the temperature rose to 37.2 degrees Celsius on 29 July. The new record exceeds the 96-year-old record of 35.9 degrees by 1.3 degrees. In Linnunlahti of Joensuu, the temperature reached 36.8 degrees, which is also higher than the former record. According to the Finnish Meteorological Institute, the mean temperature for July was also higher than usually in all of Finland. In southern and central Finland, the mean temperature exceeded the long-term average by as much as five degrees. Before this summer, the highest mean temperature for one month had been 22.1 degrees, measured in Lappeenranta in July 1925. This record was now broken at 14 observation stations. The warmest locality was Puumala, where the mean monthly temperature rose to 23.0 degrees. Mean temperatures ranged from slightly over 20 degrees in southern and eastern Finland to just under 12 degrees in Enontekiö, Lapland. In Lapland, the difference from the long-term average for mean temperatures was only 1-2 degrees. According to the Finnish Meteorological Institute, July was also characterised by the great number of hot days. The 24th of July was the only day when the temperature did not rise above 25 degrees anywhere in Finland. Utti, Lahti, Heinola and Puumala had the greatest number of hot days; at each of these localities, the temperature exceeded 25 degrees on 27 of the month's 31 days. The previous record for hot days, measured in 2003, was 22. In Lapland the temperature rose above 25 degrees on only a few days. This is common in July. On some days there was also night frost in northern Finland; in Lokka, Sodankylä, the temperature at ground level fell below the freezing point on three occasions. The lowest temperature for the month was -1.0 degrees, measured in Naruska on 24 July. Precipitation varied widely between various parts of the country and between different localities. On the Åland Islands, on the western and southern coasts and in eastern Finland, precipitation for the month remained under 20 millimetres, which is less than one third of the usual precipitation in July. On the other hand, in some localities in Lapland, rains were even uncommonly heavy. In central and northern Lapland, precipitation generally exceeded 100 millimetres, which is more than 1.5 times the normal volume. The greatest amount of rain, 144 millimetres, was measured in the village of Inari. The least rain fell in Jomala, on the Åland Islands, where only 11 millimetres of rain fell in July. The greatest daily precipitation was 60 millimetres, measured in Ylöjärvi on 14 July and in Sodankylä on 22 July. The hot weather in July gave rise to violent thunder squalls. Local damage was caused by a downburst in Kaustinen on 26 July. A few days later (29-30 July), a thunderstorm named Asta caused extensive damage at night over an area reaching from Southern Karelia to the Provinces of Ostrobothnia and Central Ostrobothnia. The highest wind speed during a thunder squall, 29 metres per second, was measured in Rukkasluoto of Rantasalmi. In addition, squalls of over 20 metres per second were registered at several observation stations. A corresponding thunderstorm had been recorded previously on 5 July 2002. In July, about 70,000 cloud-to-ground flashes were registered on land areas in Finland. This is slightly more than average. In terms of thunder, the previous more active July was in 2003; then the number of cloud-to-ground flashes registered was as high as 170,000. By the number of lightning flashes, the most active day was 14 July, when the number of cloud-to-ground flashes registered was about 9,500. In a typical year, Finland has one summer day when cloud-to-ground flashes number over 10,000. Accumulation of greenhouse gases in the atmosphere induces global warming. In consequence, climate change increases the frequency of unusually warm weather periods in the world. The occasionally intense heat wave that affected large areas of Europe in July is a reminder of how important it is for health care, rescue services and other essential functions of society to prepare for the effects of extreme weather events. The variability that characterises the Finnish weather and climate will remain a typical feature, but it is predicted, among other things, that climate change will increase the probability of unseasonally high temperatures.